First time pellet smoker owner. About everyone I know owns a Traeger, but I didn't want to go that route, and I like nice things. 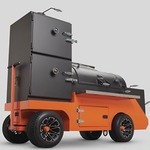 Purchased a YS640 yesterday from All Things BBQ. Brought it home, assembled, and did a burn in last night. Seasoned today, gett8ng ready for my first smoke/sear. So pumped! Best of luck! Well, don't need luck, just need to cook!